Most companies, as they work to stay current with technology, have either started their digital transformation or are still in the beginning stages of strategy development. As a cloud provider, VEXXHOST understands the complexity of these decisions as well as all the different components that make up the migration itself. 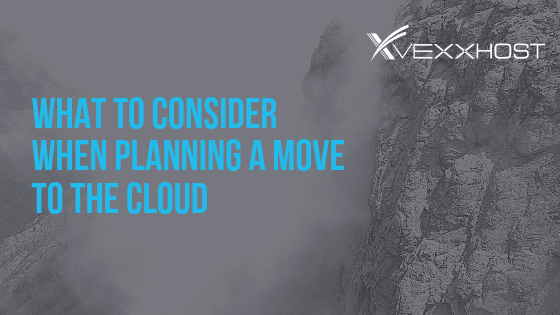 To try and simplify the process, we’re going over the three major steps companies should focus on when planning a move to the cloud; choosing the right cloud environment, evaluating and defining SLAs, and selecting the right partner and provider. When it comes to selecting the cloud environment that’s right for you and your business, there a few options to consider, starting with single or multi-cloud. Most companies choose to go with a single cloud, which essentially means a single cloud provider. Those with security concerns or potentially strict regulations may opt for a multi-cloud strategy, which gives them the option to host their data with multiple providers for redundancy purposes. With VEXXHOST, for example, there’s no worry about vendor-lock as a single cloud and we’re able to take part in a multi-cloud strategy due to our systems being powered by OpenStack, opensource, technology. The next aspect of your cloud environment is whether to choose a public, a private or a hybrid solution. With a public cloud, you opt to share resources with other users but aren’t responsible for the management of the cloud, providing easy entry and low costs. However, your desired or required level of security could determine a need for a private cloud which, whether hosted on-premise or off-premise, ensures that your components are dedicated and customizable to you. A hybrid cloud is a combination of public and private and makes for simplified scaling if you have fluctuating workloads. VEXXHOST offers all three cloud solutions and is also able to offer users a private cloud that delivers everything within one environment (ex: bare-metal, vms, kubernetes) to better serve users. Service level agreements (SLAs) are concerned with your expectations and your requirements for aspects such as the security, performance and monitoring of your system. These needs will largely be based on your industry, clients and any applicable regulations, however, they also have the potential to grow and shift. VEXXHOST can help ease this step through coupling our expertise in running Canada’s largest OpenStack public cloud with our consultation service. When making any commitment, it’s always important to take into account future needs and developments, not just concerning SLAs, but also in terms of making use of the latest technologies and the ability to scale up and down as needed. At VEXXHOST, we’re always running the latest OpenStack release and take pride in our contributions to the open source community, making upgrades and updates are a part of our commitment to our users. Once you have considered the two previous steps, you’ll have a firm grasp of your needs and requirements, helping you make a selection between the various partners and providers. Arguably, this is the most important step in your move to the cloud as your decisions and needs won’t matter if you have a provider that is unable to meet them. Other than your requirements, budget and the level of support you’ll receive are also key factors in choosing the partner and prover that is right for you. VEXXHOST can not only meet your cloud environment needs and your service level and update standards but is also committed to providing top-tier level support to our users making their migration to the cloud as smooth and seamless as possible. Making a move to the cloud can be intimidating for a lot of businesses, especially when determining important aspects such as the desired cloud environment and the SLA and upgrade requirements. However, the right provider and partner should be able to give companies a sort of relief in knowing their needs are being taken care of. At VEXXHOST we know there’s no one size fits all when it comes to individual cloud computing needs. That’s why we offer such a large selection of solutions and make meeting your needs a priority. We believe in being more than just a provider to our users, we pride ourselves on being a partner. Contact us to find out how we can help get you started on your journey to the cloud!